Metro Screen funded short film ‘Il Taglialegna’ (The Woodcutter) will screen on ABC2 this month as part of the Raw Nerve series along with films from emerging filmmakers nationally. The film within a film, ‘Il Taglialegna’ chases the budding romance of two modern-day teenagers though the nostalgic cinema and projection room of Sydney's Iconic 'Hayden Orpheum Cinema' into the eerie 1930s Italian countryside. Questioning the curse of the rare 1930's film reel in their possession, the teens discover the horrors of the woodcutter as the boundaries between reality and fantasy become beautifully blurred. Directed by Thomas McSweeney, produced by Kieran Cato and written by Ross Hubbard and Thomas McSweeney. 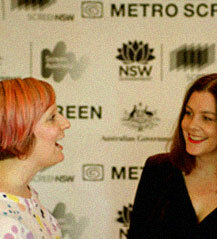 Every year Screen Australia provides funds to the Screen Network for Raw Nerve, a nation wide production initiative, which provides emerging filmmakers in each state with the opportunity to make their first professional film. Carbon Media are the first Australian production company to work with the most famous street of knowledge in the world. Founder Wayne Denning spoke with Around The Traps on NITV about the 5 Kangaroos. 2013 Metro Screen Breaks funded web-series Love Bytes is about to clock 1 million views on Youtube as their Kickstarter campaign to finish the series gears up with 20+ days to go. The LGBTQI comedy tracks three young housemates and their dating misadventures. After 2 years in Beta, VHX is now available to the public to sell their video direct to the public. The direct sales platform is pitched at individuals, distributors, studios, networks, and more. Torrent Freak reported Google's warning that draconian anti-piracy measures could prove counterproductive. Instead they should promote new business models. "There is significant, credible evidence emerging that online piracy is primarily an availability and pricing problem," Google states. Come to the Metro Screen Studios Wednesday 26 March to hear from an industry panel, watch clips, eat some pizza and meet other aspiring Film & TV practitioners. Limited places RSVP to reserve you spot. Crowdfunding Film: The Future. Now. Indiegogo and Metro Screen present a Crowdfunding workshop with a difference. This event is for serious filmmakers who are planning or about to launch a campaign to raise money for a real project. Only a handful of tickets left $10 Wednesday 9 April. Are you a producer looking to change the industry? If you are interested in learning more about the behind the scenes mechanics of our industry and how you can be involved then join us for this important briefing session with Screen Producers Australia. Wednesday 30 April, free entry book early. The Film and TV job market is in need of qualified Editors and Assistant Editors. This brand new scholarship has been designed to meet that industry need with a Certificate IV in Post Production – applications close 9 April. 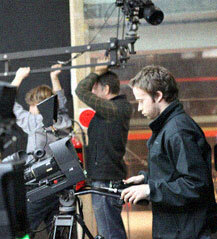 A brand new Scholarship for aspiring Assistant Directors is now open at Metro Screen April – June 2014. This heavily subsidised course designed for runners, PA’s or Third AD’s looking to take the next step in Film and Television careers has been developed to meet a critical industry shortage – applications close 9 April. This introductory course focuses on the role of a Producer in creating television programs or episodic content across a range of mediums including documentary, reality and live television. It covers everything from research and development to funding, production stages, pitching, casting and trends. The relationship between the director and the actor is fundamental to creating a great performance. Book by 27 March save $50. 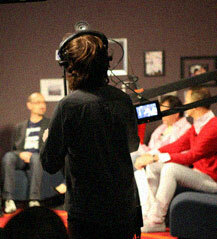 Broadcast your next event or panel discussion live from the Metro Screen multi-camera studio. Bring in your own set or use the green screen to develop a virtual backdrop for your online audience. Events can be set up to facilitate live chat and online audience interaction for real time discussion.